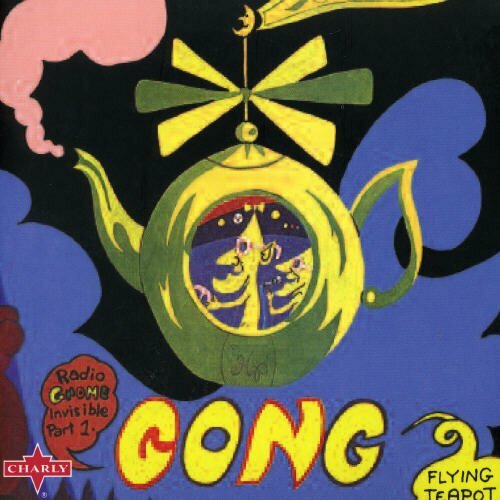 1973's Flying Teapot is a Gong milestone. It's the first installment in their legendary "Radio Gnome Trilogy" and a transitional point between the underground psychedelia of Camembert Electrique and the artier, more ethereal sound they later developed. Teapot is more visceral, less cerebral than it's successors, and the catchy ensemble riffs of Camembert are still present. The arrival of virtuoso guitarist Steve Hillage and synth wizard Tim Blake represented a great leap forward, though. Blake concentrated exclusively on ambient electronic effects and soundscapes a la early Hawkind, leaving harmonic development to the other band members. Hillage's fleet-fingered jazz-rock solos and arsenal of effects upped the musicianship a notch and reinforced the spacy jazz elements already in place. Whether you're able to follow the willfully confusing storyline or not, the elaborate mythological world created by Daevid Allen is loads of fun when wrapped around music as inspired as this psychedelic art-jazz-space rock amalgam. The key players are a group of gnomes from another planet who arrive in a flying teapot (stoner imagery plays heavily in hippie Allen's vision) to save the world (or something). Actually, some surprisingly intellectual/philosophical messages were contained in the trilogy, leavened heartily by the irrepressible Allen's healthy sense of humor. Charly. 2004.